Down 1-0 early, the Blues got goals from Matt D’Agostini and Alex Steen and Brian Elliott was sharp again in goal, stopping 21 shots to get his seventh win in eight starts this season as the Blues beat the Detroit Red Wings in front of the 49th straight sellout at Scottrade Center. The Blues penalty killing unit, which was ranked 26th in the NHL, killed off six Wings power plays including a five-minute major against Chris Stewart for a push in the back. Detroit had their four game winning streak snapped. The Blues are now 3-0-1 under new coach Ken Hitchcock and have allowed just three goals in those four games. Drew Miller scored first to give the Red Wings the early lead, then Stewart picked up the major penalty for pushing Niklas Kronwell from behind. The Detroit defenseman had to leave the game. The Blues had some momentum after the penalty kill as they got on the power play themselves not too long after the penalty kill and got a goal from D’Agostini, who was playing in his 200th career game. 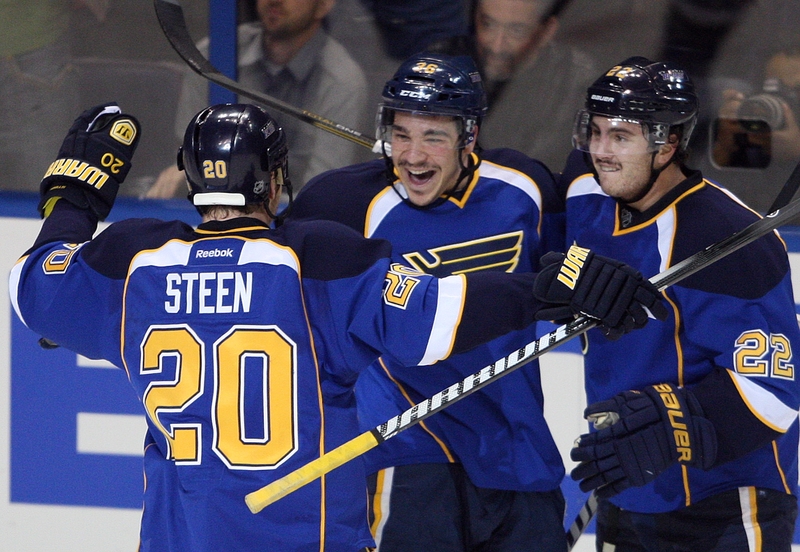 The Blues’ winger scored a power play goal with 2:41 left in the first period. 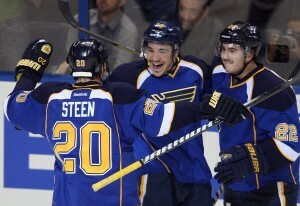 Steen added the game winner with his team-leading seventh of the season on a turnover. After Johan Franzen’s backhand clearing attempt was picked off by Steen at the blue line, he skated in and beat Howard with a wrister 10:16 into the period.